The over 100-year-old health and wellness company Hamdard India has entered the ready-to-serve beverage segment with the launch of RoohAfza Fusion to extend the product portfolio of its flagship brand RoohAfza. RoohAfza Fusion is a blend of pure fruit juice with the traditional RoohAfza that is available in five different flavours such as lemon, orange, mango, pineapple and orange, and litchi. The drink, the company said, will retain the strong taste, all the 14 herbal ingredients and colour of RoohAfza with only a dash of fruit blends for an additional twist in flavour. RoohAfza Fusion will be available in Tetra packaging, which is known to preserve the taste and flavour of the product and will be offered at the price point of Rs 20 for a 200-ml pack. "There has been a perceivable change in consumption patterns, especially in the youth who are now turning to natural, herbal products, which are perceived as more healthy. 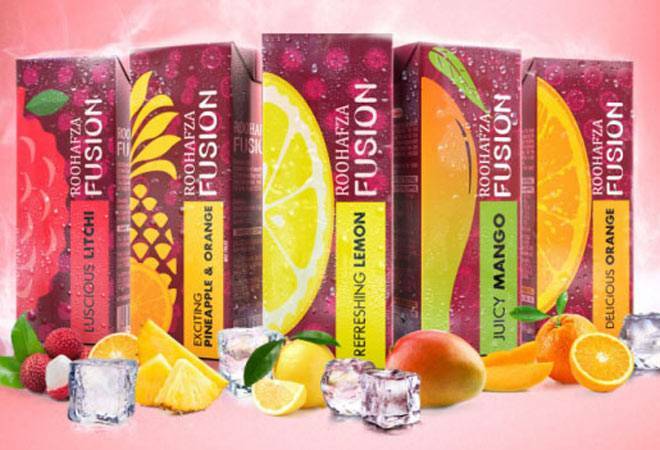 RoohAfza sits naturally on this positioning, and Fusion is hence a natural extension in the format that connects with the youth and the upwardly mobile. Fusion extends the brand to new consumers, while retaining our existing users and offering them an exciting variation of their favourite RoohAfza in fruit flavours," Mansoor Ali, Chief Sales & Marketing Officer, Hamdard said at the launch event. RoohAfza is generally an in-house consumption drink but with this new product it will be available to consumers on the go in ready-to-drink format. The company has currently launched in Delhi and Uttar Pradesh to test the market during festive season for these new products. They aim to be available in 30,000 outlets in modern trade, convenience stores and paan plus shops in these two northern states. They will do an elaborate national launch next year in February along with a 360 degree marketing campaign, said Ali. "Juice-based drinks happen to be the fastest growing segment under the soft drinks category and are projected to grow by 2.5 times the current size by 2020. So with RoohAfza Fusion we are entering the right segment at the right time," said Amit Aneja, AGM Marketing, Hamdard. The company first launched RoohAfza in the year 1907, which came to be known as a summer drink for its nutritional and therapeutic value as the product claims to help in maintaining the body's water level. The company said they are also working to re-launch their energy drink Cinkara in a new modern format and a sugar-free version of RoohAfza.